The picture was painted in 1734 in oil on canvas. Genre – still life. Direction in painting – Rococo. Jean-Baptiste Simeon Chardin was a French artist of the 18th century. His paintings have won numerous awards. He painted portraits, landscapes, still lifes. For his works he used his own style. For the image used constantly silver-gray tint. His still lifes – this is one of the most perfect works of artists of that time. In them, Chardin used simple, modest household items. But what were these canvases! Simplicity and harmony were present in them like no one else. He could imagine a simple tank or jug ​​with some kind of soulfulness. 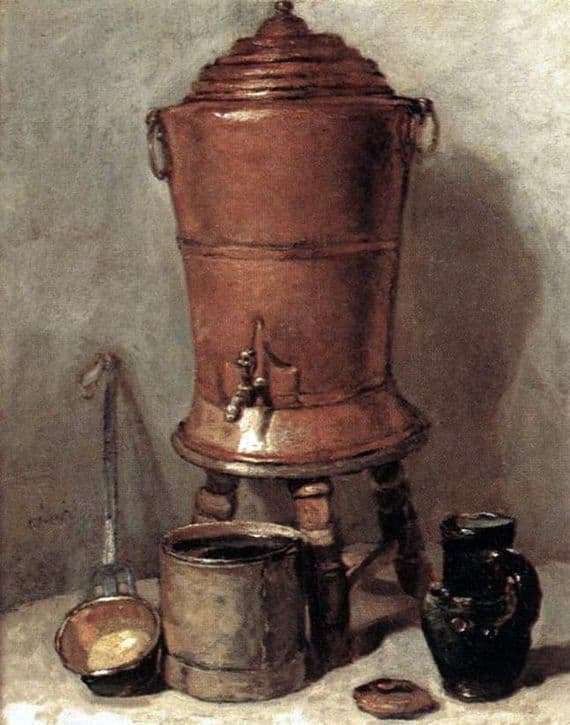 “The copper water tank” is the work of Chardin, which has a very modest set of things. The artist presented us with a copper ancient reservoir, in which in the past centuries people kept water in their houses, a clay jug stands nearby. He is also very modest and strictly looks in the overall background of the canvas. Under the carved copper faucet there is an iron container where you can draw water. The eye is attracted by a no less simple and old thing – this is a scoop. All these items are admirable. They are very simple, used daily in everyday life, but how skillfully they are made and transferred to us for our perception by the artist. Chardin masterfully depicted the shade of copper and iron. On the scoop we can see the rivets, which are made to hold a beautiful handle. The surface inside is specially depicted not uniformly, as if it was affected by water for more than one decade. On the jug there are two iron handles with which the tank was transferred to the right place. A simple water tank in the past century had a modest appearance, but was made like a work of art. The picture shows the viewer all the skill of the author, the ability to use tones and black and white effects. The canvas is stored in the Louvre. France.